Electric powertrains find increasing applications in fleet vehicles. A handful of garbage trucks in Chicago will be a whole lot quieter than their predecessors, thanks to an all-electric powertrain control system (ePCS) from Motiv Power Systems. The Bay Area startup won a contract for up to $13.4 million, its largest customer contract to-date, to provide the city of Chicago with 20 electric refuse trucks using a traditional chassis outfitted with Motiv’s ePCS system. “We don’t design a truck chassis to be electric,” said Jim Castelaz, CEO of Motiv. “Instead, we work with a whole industry of vehicle modifiers.” By having a plug-and-play technology that works with established truck frames, such as Detroit Chassis, Motiv says it can deliver the benefits of electric at lower costs. The refuse trucks will each sport ten 20-kilowatt-hour battery packs which will provide at least 60 miles of range. Garbage routes are an ideal fit for an electric truck, as long as the collection station or dump is not too far. “We look for fleets that run vehicles that get a low MPG so they’re using a lot of diesel and go on predictable routes,” said Castelaz. Motiv’s technology is essentially its controllers that optimize the power flow between the chassis and the batteries. The software also offers predictive maintenance, which can provide added value. The vehicles also come with an in-house charger, a 60-kilowatt, three-phase charger that can operate from about 208 to 600 volts. For the garbage trucks, they will take about three hours to charge, said Castelaz. Motiv estimates the cost of fuel for the trucks will be about one-eighth that of diesel. 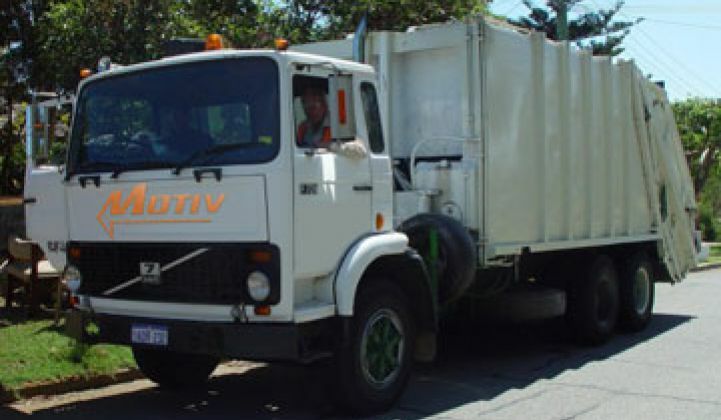 The first of the twenty garbage trucks is scheduled for delivery by the end of 2013, but in the meantime Motiv is also working on expanding into other types of trucks, including a flatbed for the city of Bakersfield, Calif., and it is also investigating solutions for utility trucks and refrigerated delivery trucks. “We want to have our technology in a variety of chassis by the end of 2013,” said Castelaz. The motives of customers vary, but generally fall into a few categories. Many, like Chicago, have mandates for greener fleets, whether using hybrids, natural gas or electric vehicles. In California, some cities and towns are focusing on air quality issues. For large companies, the volatile price of diesel has pushed them to investigate other technologies. Although the technology may be new, Castelaz said that part of his company’s appeal is that the rest of the truck is a known quantity. Motiv finds the best batteries for the truck’s job (and battery companies that will be around years from now) and uses off-the-shelf motors. Detroit Chassis will provide the refuse chassis and Loadmaster will provide the truck body for the Chicago contract. The appeal of electric vehicles for fleet vehicles with known routes is growing. The federal government, and companies such as General Electric, have committed to shifting to alternative-fuel vehicles. Last week, electric bus maker Proterra raised $23 million to scale its production of electric municipal buses and fast-charging systems. As states and municipalities need to meet increasing regulation, whether related to noise, smog or carbon, electric vehicles large and small could get a closer look.